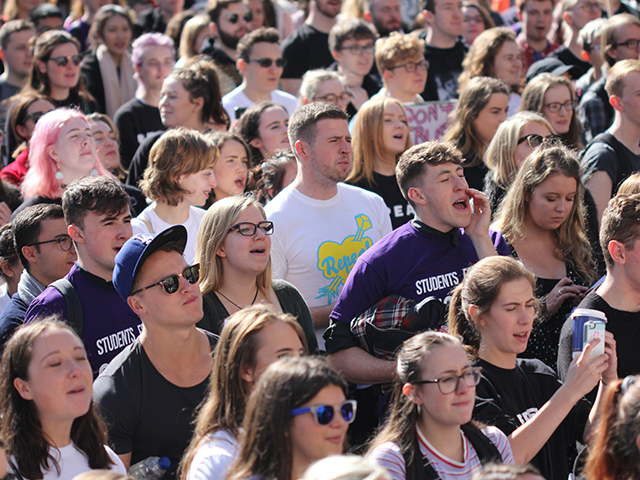 “We must stop shipping our shame across the Irish Sea,” USI president Michael Kerrigan exclaimed as he addressed over a thousand students gathered at the front square of TCD to campaign to repeal the Eighth Amendment. Among the swarm of protestors were DCU students and SU representatives who attended the event to help campaign to ensure the Government commits to a referendum on the amendment that was enacted in 1983. The Eighth amendment prohibits any cases of abortion within Ireland and places equal importance on the life of the unborn child and the mother. “I’m here because this issue doesn’t affect me, it’s not my choice, I can’t have a choice, I’m here to stand for the women who don’t have a choice and they should. Choice is the middle ground,” said DCUSU Vice President for Welfare and Equality Podge Henry. 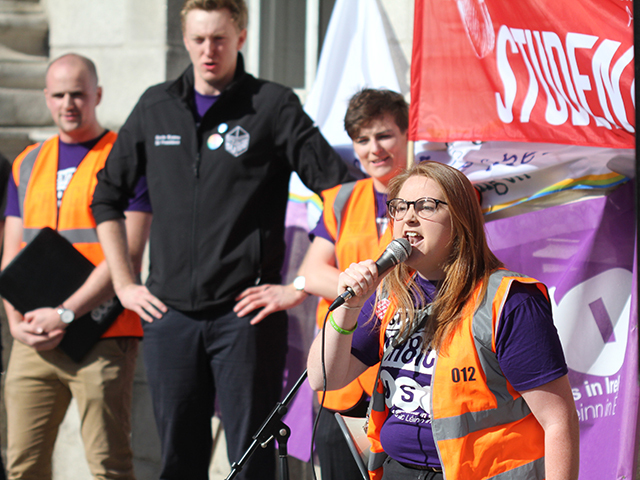 Kerrigan and USI VP for Equality and Citizenship Síona Cahill both addressed the mass of students before leading the march from TCD to the Garden of Remembrance where they were met by over 30,000 other protestors taking part in the 6th Annual March for Choice. 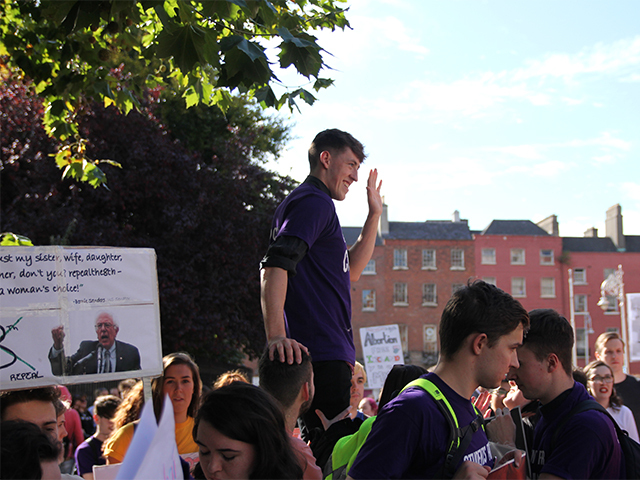 With focus on a referendum expected in May or June of next year, DCUSU president Niall Behan was hopeful that this would be one of the final times students would have to gather for a pro-choice demonstration before the legislation is changed. During the 2016 DCU referendum on abortion, 84 per cent of DCU students who showed opinion voted in favour of repealing the Eighth Amendment. In the Garden of Remembrance, the Students for Choice joined political parties and organisations from all over the country including Sinn Féin, Labour, People Before Profit, and even cross-border supporters from Queen’s University Belfast and other Northern Irish pro-choice groups. Protestors then marched on to Dáil Eireann and filtered into Merrion Square, making room for the thousands of participants campaigning for safe and legal Irish abortion services and access to information. Representatives of DCU’s LGBTA Society also attended the protest to remind the public how the Eighth amendment affects an array of students. “We must remember this is not only a women’s issue, but also a transman and non-binary issue as well. We’re here to support all individuals regardless of their gender identity,” said Dean O’Reilly, chairperson of DCU LGBTA. DCUSU plans on continuing to take an active role in upcoming events lobbying in support of the pro-choice movement.